Climate Interactive was proud to participate in an important global meeting in Nairobi recently. The Nansen Initiative is an on-going international conversation on the situation of ‘cross-border displaced persons.’ The meeting in Nairobi was one of six government consultations in different regions of the world, culminating in recommendations for governments to better coordinate around the needs and rights of displaced persons. 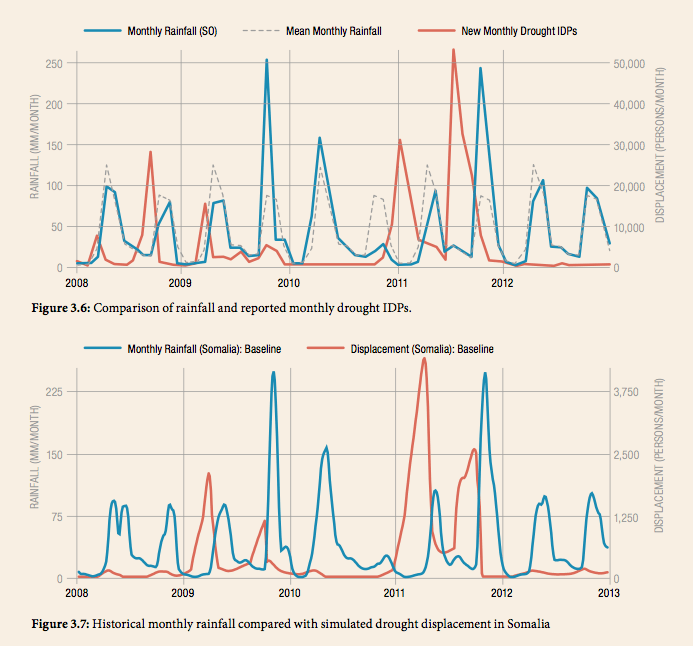 Climate Interactive provided evidence on the scope and scale of pastoralist displacement in the Horn of Africa. Climate Interactive, along with our partner IDMC, presented to approximately 100 delegates from eight countries in the Greater Horn of Africa. Delegates represented ministries of foreign affairs, ministries of agriculture, and governmental agencies responsible for natural disasters (e.g, droughts). The presentation concluded with a live demonstration of our Horn of Africa Pastoralist decision support tool. Climate Interactive and IDMC are making the tool available for use and extension by any interested government, NGO, or UN group. Graphs of historical and simulated displacement in HOA. The Pastoralist Simulator reproduces real-world behavior in several important ways.